Fifty years ago, in April 1961, the trial of Adolf Eichmann suddenly revealed to a worldwide audience in all its tragic detail, and for most people for the first time, the shocking reality of the horrors of the Nazi Final Solution. At the time it was not yet known by its current name: the Holocaust or the Shoah. Many journalists and reporters were dispatched from all over the world to cover the trial. Hannah Arendt in particular, was there for the New Yorker and produced a number of articles and a famous book entitled Eichmann in Jerusalem. Her work was both acclaimed and harshly criticized for its interpretation of those horrible events that destroyed millions of Jews and other victims in Europe during World War II. At the same time, Sergio Minerbi, a young Israeli of Italian origin who had emigrated to Palestine in 1947 was commissioned to cover the trial for Italian State Radio RAI. His work constitutes both a daily chronicle of the court proceedings with a vivid description of the atmosphere surrounding the trial inside the courtroom and within the city of Jerusalem that conveys a realistic and vivid picture of those proceedings. The result is one of the best and most fluid accounts of what happened in Jerusalem as the tribunal convened to hear the most sensational and upsetting case of crimes against humanity ever tried. 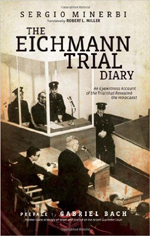 The Eichmann trial went beyond the Nuremberg trials that had barely considered the subject of genocide and extermination. It was also remarkable for another reason: the State of Israel had been in existence for just 13 years and had been founded by many of the survivors of the Final Solution. Many women and men outside the courtroom could carried their experience with them every day of their lives and could now see one of their main torturers face to face. The complaint against Adolf Eichmann, a high officer of the SS and Gestapo specialized in the "Jewish Question" on behalf of the government of Nazi Germany was therefore for his direct responsibility in the murder of the Jews. The case against him was brought directly by the injured party, namely the Jewish People.